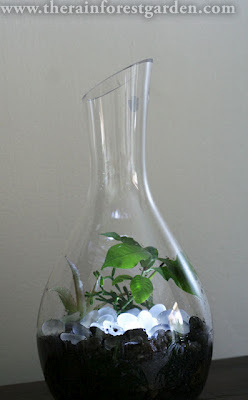 Hop over to Steve Asbell's blog The Rainforest Garden for a neat DIY guide on making this gorgeous, softly lit terrarium. I've always loved the use of glass decorative elements in terrariums for the way they catch and project light. Steve has found a way to use the protruding "bump" in the bottom of a wine decanter to actually light up the glass elements in his terrarium.